Muscular Human Anatomy Model; Life Size; Gendered Male; "Leonard" (36 Parts) -- 66.5 Model Height, 36 Removeable Parts, Incredibly Detailed. Life Size model of the human body - 66.5 in height, without base. Base Height: 5"; Overall Height (model + base): 71.5". Clearly labeled with matching number key. 36 parts - many muscles and organs removable. Some organs can be split into pieces to view the inner anatomy of the organ (examples: lungs, brain, and heart). The detailed life size 3D rendering of the male human body with its vibrantly colored anatomy is ideal for studying the structure and function of the muscles and organs of the human body. Key anatomical parts are colored and numbered for comparison with the anatomy key that is included. Many of the muscles and organs can also be removed for further inspection. Some of the organs (such as the brain, stomach, and lungs) can also be further separated into pieces to observe the detailed anatomical structures within each organ. The model is extremely detailed and provides an excellent overview of the main muscles and organs in the male human body. This detailed and vividly colored model provides a visually and kinesthetically effective method for studying the structure and function of the human body as a whole. We strive to satisfy absolutely every customer. 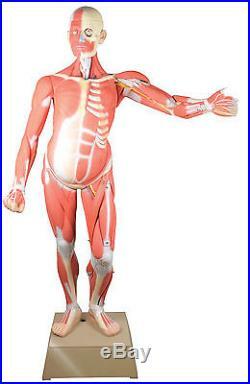 The item "Muscular Human Anatomy Model Life Size (36 Parts) - 66.5 Model Height" is in sale since Thursday, May 05, 2016. This item is in the category "Business & Industrial\Healthcare, Lab & Life Science\Medical Supplies & Disposables\Teaching & Education Supplies". The seller is "hbarsci" and is located in Rochester, New York. This item can be shipped to United States.